Pratt, G. and R.M. San Juan 2014 Film and Urban Space: Critical Possibilities. Edinburgh: University of Edinburgh Press. 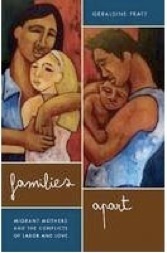 Pratt, G. 2012 Families Apart: Migrant mothers and the conflicts of labor and love. Minneapolis: University of Minnesota Press. Pratt, G. and V. Rosner (eds.) 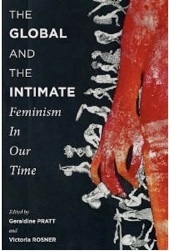 2012 The Global and the Intimate: Feminism in Our Time. New York: Columbia University Press. Pratt, G. with Migrante BC 2018 “Organizing Domestic Workers in Vancouver Canada: gendered geographies and community mobilization” Political Power and Social Theory 35: 99-119. Pratt, G. 2018 “One hand clapping: Notes towards a methodology for debating planetary urbanization” Environment and Planning D: Society and Space 36:3, 563-569. Angeles, L.C. and Pratt, G. 2017 “Empathy and Entangled Engagements: Critical-Creative Methodologies in Transnational Spaces” GeoHumanities 3:2, 269-278. Pratt, G. and Johnston, C. 2017 “Crossing Oceans: Testimonial Theatre, Filipina Migrant Labour, Empathy and Engagement GeoHumanities 3:2, 279-291. Johnston, C. and Pratt, G. 2017 “Tlingipino Bingo, Settler Colonialism and Other Futures” Environment and Planning D: Society and Space 35:6, 971-993. Pratt, G., Johnston, C. and Banta, V. 2017 “A Travelling Script: Labor Migration, Precarity, and Performance.” The Drama Review (TDR) 61:2, 48-70. Pratt, G., Johnston, C. and Banta, V. 2017 “Lifetimes of Disposability and Surplus Entrepreneurs in Bagong Barrio, Manila” Antipode, 49:1, 169-192. Pratt, G., Johnston, C. and Banta, V. 2017 “Filipino Migrant Stories and Trauma in the Transnational Field” Emotion, Space and Society, 24, 83-92. Pratt, G. 2015 “Between Colonialism and Settler Colonialism: Filipino Youths in Canada” Singapore Journal of Tropical Geography 36(3): 305-307. Pratt, G. and Johnston, C. 2014 “Filipina Domestic Workers, Violent Insecurity, Testimonial Theatre and Transnational Ambivalence” Area, 46(4):358–360. Pratt, G. and Johnston, C. 2013 “Staging Testimony in Nanay” Geographical Review, 103:2, 288-303. Lee, E. and G. Pratt 2012 “The Spectacular and the Mundane: Racialised State Violence and Filipino Migrant Families” Environment and Planning A, 44:889-904. Pratt. G. 2010 “Listening in spaces of ordinariness: Filipino-Canadian youths’ transnational lives” Children’s Geographies 8 (4) 343-352. 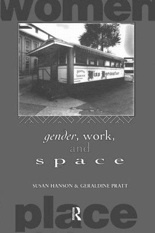 Pratt, G. 2010 “Collaboration as feminist strategy” Gender Place and Culture 17, 43-48. Johnston, C. and G. Pratt. 2010 “Nanay (Mother): a testimonial play” Cultural Geographies 17, 123-133. Pratt, G. in collaboration with the Philippine Women Centre of BC 2009 ”Circulating Sadness: Witnessing Filipino Mothers’ Stories of Family Separation” Gender Place and Culture, 16, 3-22. Pratt, G. and Johnston, C. 2009 “Translating Research into Theatre: Nanay: a testimonial play” B.C. Studies 163, 123-132. Reprinted in Popular Political Theatre and Performance. Julie Salverson (ed.) Toronto: Playwrights Canada Press. Pratt, G. in collaboration with Philippines-Canada Task Force on Human Rights 2008 “International Accompaniment and Witnessing State Violence in the Philippines” Antipode, 40:5, 751-779. Pratt, G. and Johnston, C. 2007 “Turning Theatre into Law, and Other Spaces of Politics” Cultural Geographies, 14, 92-113. Walton-Roberts, M. and Pratt, G. 2005 “Mobile Modernities: A South Asian Family Negotiates Immigration: Gender, Sexuality and Class in Canada”, Gender Place and Culture, 12, 173-195. Pratt, G. 2005 “Abandoned Women and Spaces of the Exception” (2005 Antipode Lecture) Antipode, 37(5). 1053-1078. Pratt, G and Kirby, E. 2003, “Performing Nursing: the B.C. Nurses’ Union Theatre Project” ACME, 2: 14-32. Pratt, G. 2003 “Valuing Childcare: Troubles in Suburbia” Antipode, 35, 581-602. Reprinted in Life’s Work, (eds. K. Mitchell, S. Marston and C. Katz), Blackwell, 2004, 164-184. Pratt, G. and Yeoh, B. 2003 “Transnational (Counter) Topographies” Gender Place and Culture, 10, 159-166. Pratt, G. in collaboration with Ugnayan ng Kabataang Pilipino sa Canada, 2003 “Between Homes: Displacement and Belonging for Second Generation Filipino-Canadian Youths” B.C. Studies, 139, 41-68. Reprinted in Asian Canadian Studies Reader (eds. Roland Sintos Coloma and Gordon Pon) Toronto, University of Toronto Press, 2017. Pratt, G. with Jacobs, J. 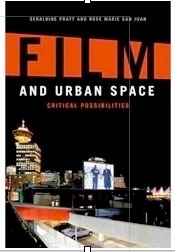 2018 ‘Film and Thinking Space’ in Doreen Massey: Critical Dialogues (eds.B. Christophers, R. Lave, J. Peck and M. Werner) Agenda Publishing, 277-288. Pratt, G. 2017 “Children and the Intimate Violence of Transnational Labor Migration” in Conflict, Violence and Peace, Geographies of Children and Young People (eds. C. Harker et al.) Springer: Singapore, 387-407. 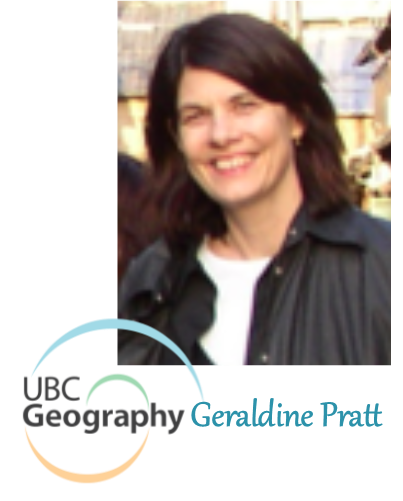 Peake, L. and G. Pratt 2017 “Women in Cities” inUrbanization in a Global Context: Canadian Perspectives. (eds. A. Bain and L. Peake) Oxford University Press. Pratt, G. and C. Johnston in collaboration with the Philippine Women Centre of BC, 2014 “Nanay, a testimonial play” in Once More with Feeling: Five Affecting Plays (ed. Erin Hurley) Toronto: Playwrights Canada Press, 57-90. 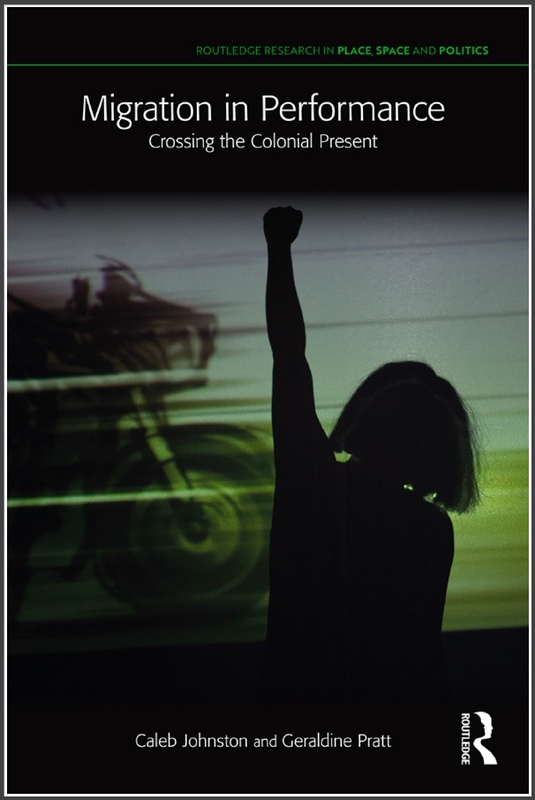 Johnston, C. and G. Pratt 2014 “Taking Nanay to the Philippines: transnational circuits of affect” in Theatre of Affect (ed. Erin Hurley) Toronto: Playwrights Canada Press, 192-212. Pratt, G. and M. Kraft, 2014 “Masculinity-Femininity” in Introducing Human Geographies, 3rd ed. (eds. Paul Cloke, Philip Crang, Mark Goodwin) Hodder Arnold, 82-96. Pratt, G. and C.B. Erengezgin 2013 “Gender” in New Companion to Cultural Geography. Nuala Johnston, Richard Schein and Jamie Winders (eds.) Wiley Blackwell, 73-87. Pratt, G. 2013 “Unsettling Narratives: Global Households, Urban Life and a Politics of Possibility” in Rethinking Feminist Interventions in the Urban. Linda Peake and Martina Rieker (eds.) Routledge, 108-124. Pratt, G. 2012 “Between the sheets” in Filipinos in Canada: Disturbing Invisibility. R. Coloma, J.P. Catungal, B. McElhinny (eds.) University of Toronto Press, 205-216. Lee, L. and G. Pratt 2011 “Migrant Worker: Migrant Stories” in Mobilities: Practices, Spaces, Subjects. T. Cresswell and P. Merriman eds. Ashgate, 225-238. Pratt, G. in collaboration with the Philippine Women Centre of B.C. and Ugnayan ng Kabataang Pilipino sa Canada/Filipino-Canadian Youth Alliance 2009 “Seeing Beyond the State: Towards Transnational Feminist Organizing” in Critical Transnational Feminist Praxis (Eds., Amanda Swarr and Richa Nagar) SUNY University Press, 65-86. Pratt. G. 2008 “Complexity and Connection” Feminisms in Geography: Space, Place and Environment. Edited by Pamela Moss and Karen Falconer Al-Hindi. Rowman and Littlefield, Lantham, 68-74. Pratt, G. and C. Johnston, 2007 “Putting Play to Work” in Politics and Practices in Economic Geography, (eds, A. Tickell, E. Sheppard, J Peck, and T Barnes), Sage, London. Pratt, G. 2007 “Das raumliche Imaginare eines globalen Feminismus” (Global Feminism’s Spatial Imaginaries) in Gender in Motion. Dominique Grisard, Jana Haberlein, Anelis Kaiser, Sibylle Saxer (eds.) Campus Verlag: Frankfurt, New York, 81-101. Pratt, G. in collaboration with the Philippine Women Centre of B.C. and Ugnayan ng Kabataang Pilipino sa Canada/Filipino-Canadian Youth Alliance, 2007 “Working with Migrant Communities: Collaborating with the Kalayaan Centre in Vancouver, Canada in Participatory Action Research Approaches and Methods: Connecting People, Participation and Place (Eds. Sara Kindon, Rachel Pain and Mike Kesby) Routledge, London,95-103. Pratt, G. in collaboration with the Philippine Women Centre, 2005 “From Migrant to Immigrant: Domestic Workers Settle in Vancouver, Canada” in Companion to Feminist Geography (eds. Lise Nelson and Joni Seager). Blackwell, 123-137. Pratt, G. 2005 “Masculinity-Femininity” in Introducing Human Geographies, 2nd ed. (eds. Paul Cloke, Philip Crang, Mark Goodwin) Hodder Arnold, 96-109. Pratt, G. and R. M. San Juan, 2004 “In Search of the Horizon: Utopia in the The Truman Show and The Matrix” in Emancipatory Cities (ed. Loretta Lees). Sage, 192-206.